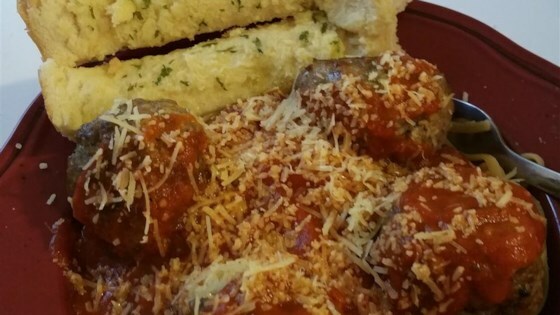 "Turkey, beef, and Italian sausage meatballs that go perfectly with your favorite marinara sauce. Serve over pasta!" Combine ground meat, onion, eggs, bread crumbs, oats, and seasoning in a large bowl. Shape into 2-inch diameter balls. Heat enough vegetable oil in a large saute pan to be 1/2 inch deep. Brown meatballs in hot oil for about 5 minutes. Transfer to a glass baking dish. I followed the recipe as-is. My meatballs came out tough. I don't know - perhaps I packed them a little too much? I do like the flavor, but the texture didn't work for me and my family. These are very moist and flavorful. They also freeze really well for a quick weeknight dinner! This recipe is now the basis for all my meatloaf and meatball dishes! Very good.